I grew up in a large Italian family. Needless to say, pasta was a staple in our home. It was a guarantee that every Sunday we would sit down to a pasta dinner and often one other day in the week too. It was a meal that brought our family and friends to one table where we ate together, talked with one another, and built our relationships. Pasta was basically a member of our family. But, like most Americans, I never really understood the purpose of the pasta. I was all about the sauce. As far as I was concerned, the pasta was nothing more than a vessel to serve the neck bone gravy on. It was this perfectly doughy, slightly chewy part of our dinners that we all looked forward too. As I grew, it all changed. I took my first trip to Italy at the age of 14. I tasted and experienced foods out there I would never forget. One of the things that stood out the most was the pasta. The flavor and texture of every bite of pasta was different than anything I had ever experienced back home. But I couldn’t explain it and I was far from understanding it. One thing was for sure, I was obsessed. As my culinary career started to grow, so did my understanding of ingredients. I trained under some really amazing chefs who believed that every ingredient had a purpose on the dish. I adopted those beliefs… especially for pasta. I quickly began to read everything I could get my hands on about the history of pasta, the regions and the different shapes. I began to develop my own understanding of the purpose and function of pasta. The quality of the noodle, the way it should be cooked, and most importantly, how the sauce supports it. Yes, I said how the sauce supports the noodle. Weird, right? It was to me when I had this breakthrough, but to people all over Italy, this is the only way to think. Each shape of pasta is designed to be paired with a different type of sauce. Spaghetti, linguine, and capellini are considered long and thin noodles. These noodles are best accompanied by lighter oil based or delicate seafood sauced like vongole or aglio olio. 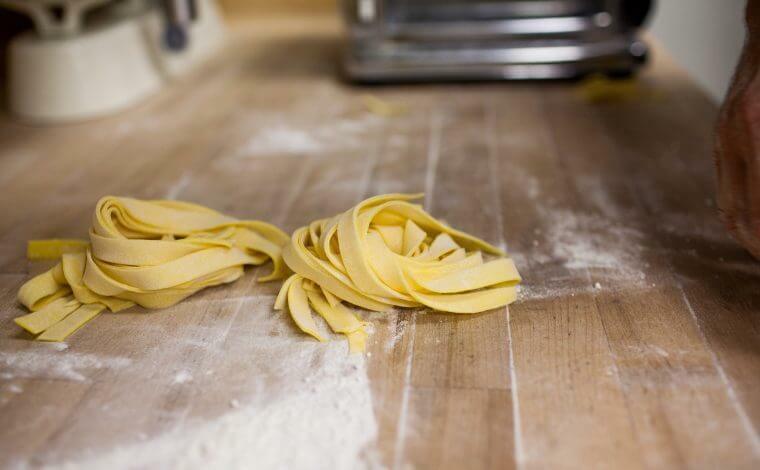 Pappardelle, malfaldine, fettuccine, bucatini and tagliatelle are long and wide noodles. The width of the noodles gives them more surface area to stand up to richer, meatier sauces such as a neck bone gravy or beef ragu. Penne, rigatoni, conchiglie, and paccheri are shorter, hollow shapes. These shapes were designed to allow for heavier ingredients to be scooped and grabbed by their openings. Ground meat sauces like Bolognese, or hearty meat and vegetable sauces are perfect for these. Their thicker texture also makes them perfect for baking with cheese. Caserecci, strozzapreti, gemelli and fusilli trofie are short, delicate twisted noodles. The small curves allow the noodles to grab lighter, smooth sauces such as a pesto sauce or butter sauce. They do not work well with larger chunks of ingredients, but julienned vegetables or other accompaniments cut similarly to the noodle pair nicely. Ditalini, pastina, stelline and acini di pepe are too small to eat with a fork. Unlike the other noodles, these were made to be added to a broth. These are traditionally added to soups like Italian wedding soup and pastina in brodo. Ravioli, tortellini, sacchetti and agnolotti are merely a few of the endless amount of stuffed pasta shapes. Since their fillings are the main flavor of the dish, gently wrapped in pasta dough, they are best served with a smooth sauce or a light butter sauce. Now you might be asking, what about gnocchi or cavatelli? Those are technically dumplings. They fit into a different category and we will visit that in the near future. The next important thing is the quality of the noodle. I used to think you could buy any box of pasta and it would be fine. Then I started to see some very expensive pastas in the store, almost triple the price of the ones I used to buy, and decided to try those. They weren’t necessarily better. The price has nothing to do with the value and quality. While good pasta is slightly more expensive than a standard one, the difference will not be significant. I always try to buy pasta that have been cut with bronze dies. It will say right on the package. The bronze die helps give a certain texture to the noodle that factory produced pasta can’t provide. Mass produced noodles have a smooth texture that won’t allow as much sauce to stick to them. The other factor I look for is if the pasta was produced in Italy. I know this may sound a little cliché, however, the durum wheat and water in Italy are both completely different than what we can get here. The pastas from Italy tend to have a wonderfully light chew and the wheat in the gives a completely different flavor and the pasta absorbs the sauce better. This allows for a light coating and glossy finish on your pasta dish. Since you can’t open and taste the pastas at the grocery stores, this may take a little trial and error. But after a few tries, you are sure to find a pasta that fits what you love. Once you do, I can guarantee you won’t buy any other kind.